Consumers can access up to eighteen different services from each self-serve kiosk to top up airtime, pay bills, download ringtones and more. ACTIVE POSTER: An NFC start/confirm area and a touch-screen keypad make a standalone self-service kiosk. Click to enlarge. Tata Docomo has signed an agreement with US-based Xius that will see the mobile network operator testing Xius’ Mobile Touch Transaction (MTT) solution in the city of Hyderabad, India. 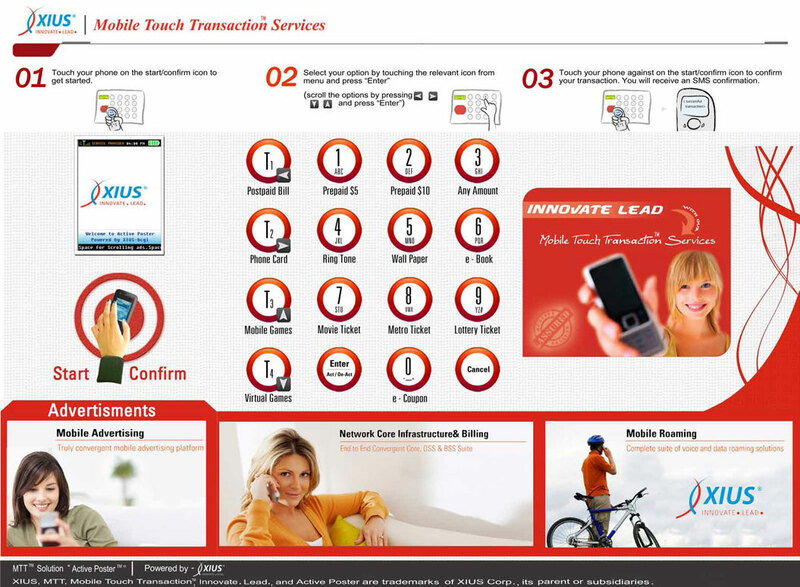 The self-service MTT terminals, which Xius calls active posters (APs), allow customers to pay bills, to top up their prepaid talk time account, to download ringtones and wallpaper and perform a number of other value-added services using NFC. The active posters are designed to act as virtual malls, enabling as many as eighteen different services to be offered at any customer gathering point. To use the service, customers simply touch their NFC phone — or an NFC-compatible contactless or RFID sticker or card — to the ‘start/confirm’ area in the mid-left position on the active poster. This prompts the built-in smartphone sized display, located above the start/confirm area and shown carrying a Xius advert in the diagram, to begin showing a set of instructions. The customer can then choose which of the services on offer he wishes to access by touching the red circles located in the central area of the active poster. He then confirms the transaction by touching his device to the start/confirm ‘button’ a second time. In the current version, the service options and the advertisements shown across the bottom of the poster are delivered via a printed sheet of paper that sits behind a clear plastic protector and on top of embedded electronic circuitry that includes a link to the operator’s back office systems in order to process and activate requested services. The active poster measures only 1.5 inches (less than 4cm) thick and can be built into a variety of display equipment including kiosks, Jim Hunt, VP of marketing at Xius, has told NFC World. And future versions are set to make use of e-paper rather than a printed sheet, Hunt explained, so that both the services on offer and the advertisements displayed to users can be changed dynamically as required by the operator of the MTT terminal. “The MTT solution addresses the mobile operator’s desire to increase its retail points of presence, provide self-service to more non-traditional top-up and other value-added service points (coffee shops, etc),” says Xius. Further trials are on their way, Hunt told NFC World: “We are scheduling multiple trials with multiple customers,” he explained.